Borders add a great sense of balance to a layout. Here I will show you how to create an effective border by combining a series of stickers and adding some depth. I will also demonstrate how to enhance your layout by customising your background. This layout was created using Dark Green Bazzil cardstock, tan cardstock, white cardstock, three different sets of alphabet stamps, white ink pad, umber ink pad, brown striped ribbon and Stamping Station Safari Stamps stickers. Begin by creating your border along the bottom of the page. Cut a strip of tan cardstock approximately 2.5cm wide and place it across your page about 2.5cm from the bottom. This is the base for your border. 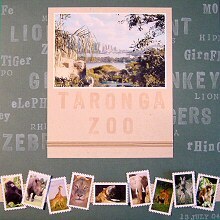 Select the Stamping Station Safari Stamps stickers you wish to include in your border. Cut each one out from your sheet of stickers and play with the arrangement. When you are happy with their placement, stick them down. To add extra depth, you may with to mount each one on cardstock first. You may also wish to use foam tape on a few of them as I have done (I used foam tape on the rhino, tiger and zebra). This gives your layout some extra dimension. Now that your border is complete, you can move on to the next step. Mat your photo on white cardstock. Cut a piece of tan cardstock approximately 17cm by 20.5cm. Position your photo in the middle towards to top. Using your largest alphabet font stamps, stamp your title in umber on the tan cardstock underneath your photo. To finish it off, adhere a strip of ribbon along the bottom of the tan cardstock. You have now created your centrepiece. Position it on your page, but do not attach. Instead, take note of the area it will cover and set it aside for now. Using your alphabet stamps and white ink, stamp various words on your background (keep them above the border area of your page). I have used animal names such as lion, tiger, zebra and monkey as they tie in with my theme, but you can use whatever words you like. Remember not to stamp inside the area your photo will cover as this wastes your time and your ink. For the most effective look, combine three different fonts (all different sizes). Make sure some of your words appear to finish off the side of your page or under your photo. If you wish, you can also stamp a date or small note in the bottom right-hand corner, as I have done. Once the ink has dried, attach your photo and voila...your page is done!